Are probiotics just for sick dogs? Probiotics, also known as ‘friendly bacteria’ are essential to every healthy immune and digestive system. 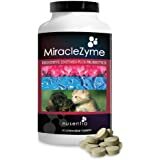 By supplementing your dog’s food with a probiotic supplement, you help to increase the levels of friendly bacteria and crowd out bad/unhealthy bacteria which can cause illness and malnutrition. The best probiotic supplements contain highly stable strains of probiotics which are proven to pass through the stomach acid and implant in the intestine. These strains have been researched to be beneficial specifically for dogs and cats. Will my dog like the taste of the probiotics on the dog food? The best probiotics for dogs powder will have essentially no flavor and no fillers and the serving size should be tiny. It is likely that your dog or cat will not even detect that the probiotics are on the food. Are there any side effects of giving my dog probiotics? Probiotics have no known negative side effects, it is considered a holistic supplement. Also there is no risk of over-supplementation. Will probiotics have any negative interaction with other medications? It is safe to take a probiotic supplement with any medication. There are no known drug interactions. If your dog is on antibiotics, read this article: Your Dog Is On Antibiotics, What Do You Do Next? Can I give probiotics to my puppy? YES! Because your puppy has a developing immune system, it is especially recommended that you give your puppy probiotics during the first 2 years of life. By doing this, you will help to support his body against developing allergies and other digestive and immune conditions. Is it necessary to refrigerate probiotics for my dog? A stable powder formula should require no refrigeration to maintain label claim potency, however, refrigeration can help to preserve the viability of the bacteria for a longer period of time. If you do refrigerate probiotics, be sure to keep the lid closed tightly and avoid moisture developing in the canister which can mess with the efficacy of the probiotics. What should I expect after I start my dog on probiotics? There is a week by week description of what typically happens to your dog's body when he's first given probiotics. Read More. What is FOS Inulin Fiber? Prebiotics are an important ingredient in any good probiotic supplement for dogs. FOS, or inulin fiber, is the most common, but there are others. Read More. 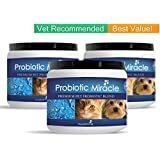 How long will it take for probiotics to help my dog with diarrhea? The best support for probiotics is for reducing diarrhea in dogs and loose stool. For more information on treating diarrhea with probiotics, read more here. Can probiotics help with my dog's yeast infection or yeast overgrowth on the skin? Read more about the signs, prevention, and treatment of yeast in dogs with probiotics. Read More. My Dog Has Diarrhea! How do I stop it?